August has been an excellent month for the celebration of music in the Brecon Beacons National Park and it’s not over yet! We’re proud to say that not only do we have one of Britain’s biggest jazz festivals but the area also hosts Wales’ biggest music festivals within weeks of each other. So after the success of last weekends Brecon Jazz Festival, it’s time to put away the saxophone and get out the guitar for the Green Man Festival. So if you’re heading to the Green Man Festival and would like to explore the surrounding area here are our top five recommendations to discover more about Crickhowell and around Glanusk click here. 1. Go for a hike with a local walking guide. North of the Green Man site in the Glanusk estate the area is surrounded by the stunning Usk Valley, and the Black Mountains. If you’re unsure where to walk book a local walking guide, to take you on a bespoke walk. 2. Head to Crickhowell for a spot of shopping. Crickhowell High Street is one of the few shopping streets left in the country where local businesses selling local produce and local products recall a long lost era when all high streets reflected the character of their town and had their own identity. Here you will be welcomed by friendly and knowledgeable shop keepers who take a real pride in what they sell. There is also a wide selection of places to eat from pubs to cafes and a bistro. Take your time – but it is impossible to hurry! 3. Discover the Crickhowell’s Art Trail and Gallery. Visitors won’t be surprised to know that the Brecon Beacons is an area popular with artists. Experience the best of Brecon Beacons art by embarking on an interesting tour of the area. 4. Enjoy a horse ride with Golden Castle Riding Stables. 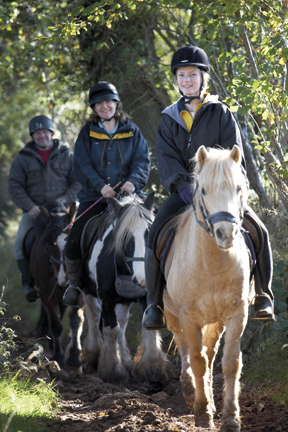 Golden Castle Riding Stables is a member of British Horse Society. There are friendly, qualified staff, and expertly trained and produced horses and ponies; from those who inspire confidence to those who will help you learn. 5. Visit our local World Heritage Site – the Blaenavon Ironworks & Big Pit. The World Heritage Site of Blaenavon, just a short drive from Crickhowell, was at the centre of many developments during the Industrial Revolution. The ironworks here, built in 1788, is one of the best preserved in the World. This entry was posted in Activities, Events and tagged Brecon Beacons National Park, things to do around the greenman festival, top five things to do around glanusk estate. Bookmark the permalink.